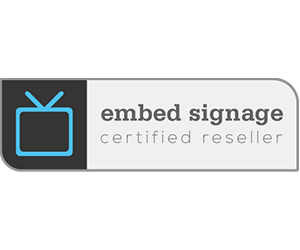 The embed signage reseller partner program is designed for professional agencies, distributors and integrators. As a reseller you’ll receive discounted pricing, customisable brand features plus marketing and support material to help you gain new business and confidently maintain current ones. This program is built for business professionals that are providing digital signage as a service to their clients and as such we need to take a look at your company to make sure you fit this category before you can begin your journey to becoming an embed signage reseller.